On behalf of Immigration Partnership Waterloo Region, I congratulate all of you on your special day of celebration. Immigration Partnership Waterloo Region is a community partnership of organizations from settlement, health, community, social services, business, employment and education agencies all working together to assist the successful integration of newcomers into our local community. Our vision is to continue to develop this Region into a community where immigrants and refugees want to settle, work and belong. Somewhere along your journey from your home country as a stranger to this place today as a new Canadian citizen, you may have worked with settlement agencies such as KW Multicultural Centre, YMCA Immigration Services or the Mennonite Coalition for Refugee Support, just to name a few. To get your first employment here in the Region, you may have worked with the Working Centre downtown to brush up your resume or attended events provided by the Greater Kitchener Waterloo Chamber of Commerce. You may also have chosen to come to this community for your children’s education and interacted with school boards, universities or colleges in this Region. Immigration Partnership Waterloo Region works with and through all of these various organizations to facilitate the successful settlement and engagement of immigrants and refugees old and new to build a vibrant and thriving community that all of us want to call home. Today, you are the perfect picture of our vision – new Canadian citizens in Waterloo Region who chose to settle, work and finally belong to Canada. What does it mean to “belong” to Canada? To obtain your Canadian citizenship, you not only applied, but also went through a thorough investigation, language & knowledge test, and waited to earn your membership to belong to this great nation. However, just having your Canadian citizenship certificate on your living room wall will not make you feel more “belong” to Canada tomorrow than now, just as you don’t lose any weight simply by having a gym membership in your wallet. You must use your membership to exercise to become a healthier person. You must exercise your citizenship to become a Canadian in your heart. How will you exercise your Canadian citizenship? You must take action – to vote for example (you just missed your opportunity yesterday!). About 22 years ago, I was sitting at the same seat where you are sitting right now, along with my family. As a young adult, becoming a Canadian citizen was the first adult decision I had to make on my own. But, I did not know what it truly meant. Would my Canadian citizenship make me “Canadian”, like those who were born in Canada? 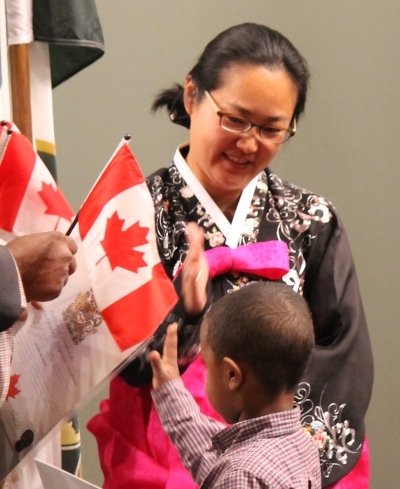 Who would call me a Canadian citizen when my skin colour shows I am an Asian? After 22 years, my answer is “Who cares?”! It is not other people who need to accept you as a Canadian citizen. It is you who need to accept yourself as a Canadian citizen first, in order for you to believe you belong to this country. What you believe will be reflected in how you act – you will be a true Canadian when you act upon your membership called “Canadian citizenship”. And just like your gym membership, you cannot turn into a healthier person over one 5-hour exercise at once – it takes a 30 min of running everyday over the period of time for you to become a healthier person. So what action can you take every day to become a better or truer Canadian citizen? How about reading a local newspaper every morning? How about helping out at your children’s school? How about helping out at a local food bank? How about attending a local fundraising event to support charity, like United Way? The list is endless – but, it takes you to take that first small step in exercising your Canadian citizenship today. What would you like to do first? 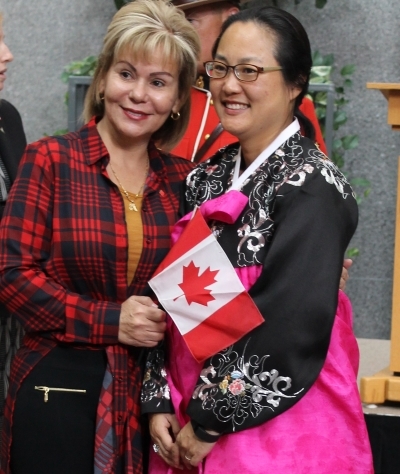 After spending more than 22 years as a Canadian citizen, I am proud to call myself a Canadian with Korean heritage. 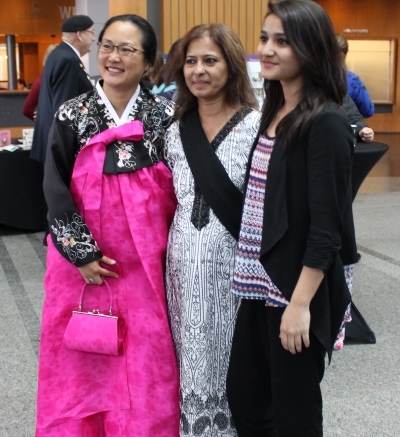 I am very proud of my Korean heritage – like my traditional dress here. But, I was born into it as an accident of birth, whereas I chose to make Canada my country by my own will. Today, you have made the same decision I made 22 years ago. I can’t wait to witness how you exercise your new membership! I am excited how you will make a positive impact on Waterloo Region and Canada as a whole, as you continue your incredible journey to make Canada your home. Thank you so much for inviting us today to witness your declaration to be a part of this great nation. On behalf of all who have stood in your place before, welcome home.